Important to the GIScience research community and agenda, especially as far as the federal government is concerned, is the Mapping Sciences Committee (MSC), a standing committee of the Board on Earth Science Resources of the National Research Council. What is this committee; where did it come from; what are its activities and responsibilities; and how do they impact the world of geographic information science, especially with regard to research and development? In this essay, the current MSC chair attempts to answer these questions and reveal MSC as a unique and important vehicle for advancing the science relating to geographic information in the United States. To understand the Mapping Sciences Committee, it is first important to understand the role that the National Academy of Sciences (NAS) has played in United States history. The NAS origins lie in the Civil War, when President Abraham Lincoln was attempting to get access to the highest level of expertise and knowledge available to the small and stretched federal government. The Civil War Act of Incorporation, signed by Lincoln on March 3, 1863, established service to the nation as the dominant purpose of the National Academy of Sciences. The initial mission was to "investigate, examine, experiment, and report upon any subject of science or art" whenever called upon to do so by any department of the government. With only a small number of initial members, the early NAS took on studies commissioned by the government on everything from weights and measures to currency to the permanence of military gravestones. Slowly, the workload increased, such that in 1916 the academy established the National Research Council (NRC) at the request of President Woodrow Wilson to recruit specialists from the larger scientific and technological communities to participate in advising the nation during World War I. With the armistice in 1918 and the formal end of the war in 1919, Wilson issued an executive order asking the academy to perpetuate the National Research Council for the peacetime to follow. This arrangement has persisted: subsequent executive orders by President Dwight Eisenhower in 1956 and President George H. W. Bush in 1993 have reaffirmed the importance of NRC and further broadened its charter. The academy has enjoyed presidential support, most recently when President Barack Obama addressed NAS on April 27, 2009, stressing the value of expert scientific advice to the nation. Today, the National Academies perform an unparalleled public service by bringing together committees of experts in all areas of scientific and technological endeavor. Experts serve pro bono to address critical national issues and give advice to the government and the public. Four organizations now comprise the National Academies: Institute of Medicine, National Academy of Engineering, National Academy of Sciences, and National Research Council. Members of the National Academy of Sciences are elected to the prestigious office and include GIScientists such as Michael Goodchild, Waldo Tobler, and Luc Anselin. While NRC has conducted many mapping-related studies, MSC has somewhat more recent origins. In 1989, NRC established MSC to provide "independent advice to society and to government at all levels on scientific, technical, and policy matters related to spatial information." MSC's initial years coincided with the developing vision of a U.S. National Spatial Data Infrastructure. Two early reports in particular set forth many of the arguments that later found their form in the many projects to make public domain geospatial data available over the Internet and the World Wide Web. In 1990, the Office of Management and Budget (OMB) established the Federal Geographic Data Committee (FGDC), an interagency group that has remained important in the development of standards, policy, and Web portals ever since. In 1994, under President Bill Clinton, Presidential Executive Order 12906 was issued, calling for a national "Spatial Data Infrastructure," formalizing standards across the government and smoothing the way for accessible and useful geospatial data from many agencies, such as the Census Bureau, National Oceanic and Atmospheric Administration (NOAA), and the United States Geological Survey (USGS). By the end of the 1990s, the vision of ubiquitous and highly accessible data for the general public saw several practical implementations, including MapQuest (1996) and TerraServer (1998). MSC input had led federal agencies to think seriously about public data, open access, and value-added information. Since 2000, we have seen the rise of the concept of a Digital Earth; the 2002 Revision of Circular A-16, Coordination of Geographic Information and Related Spatial Data Activities; the 2002 National Map (which was reviewed in concept by MSC); the e-initiatives and Geospatial One-Stop (2003); and, by 2005, the popularization of new Web mapping and visualization technologies. Much of the promise of concepts examined in the early MSC studies had, in effect, come into existence. Given this, MSC's scope not only started to broaden for reasons of national needs but also because GIScience was already being considered a mature, rather than an emergent, field of study. The Mapping Sciences Committee still performs important functions and often drives major issues surrounding geographic information science. The committee's membership is appointed, and appointments are carefully screened to balance the user communities that the committee serves, including the government, industry, and academia. All NRC committees are held to rigorous standards of independence and peer review. Goals are to provide an impartial forum for discussing geospatial issues, develop emerging study ideas, respond to agency and congressional requests, conduct outreach, and host the National Geospatial-Intelligence Agency (NGA) Academic Research Program Symposium. Most meetings have both open and closed sessions; open sessions are public meetings, and a great deal of the information assembled and used (including the reports as PDF files) is distributed either via Web sites or the National Academies Press (www.nap.edu). The Mapping Sciences Committee organizes and oversees studies that provide independent advice to society and government at all levels on scientific, technical, and policy matters relating to spatial data. It also addresses aspects of geographic information science that deal with the acquisition, integration, storage, and distribution of spatial data. Furthermore, through its studies, the committee promotes the informed and responsible development and use of spatial data for the benefit of society. The committee primarily does this by commissioning studies, assembling teams of well-qualified individuals willing to serve on those committees, and seeing the studies through to their results by holding a workshop or producing a major report. The committee members' responsibilities include surveying and assessing the field and its development and soliciting ideas on problems and opportunities from the broader community (agencies, academia, the private sector). This is sometimes done by having theme meetings, where briefings and discussions during one day of the twice-yearly meetings are devoted to an area with the potential for a new study. The committee also nominates ad hoc committee membership and oversees the follow-up to the various reports created. In most cases, MSC deals with selecting a report topic, writing and clarifying the statement of task for the study, collaborating with the report's sponsors, and nominating members of the ad hoc committee. At that point, the ad hoc committee takes over the task of conducting the study, often spread over multiple meetings, workshops, briefings, etc. The ad hoc committee writes the report, which is edited and subjected to rigorous external peer review. The last few years have been very active for MSC, with a strong sequence of reports published, many of which have drawn a great deal of attention and interest nationally. 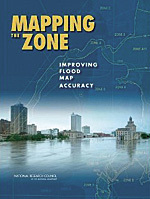 In 2009, MSC released the report Mapping the Zone: Improving Flood Map Accuracy. This study examined the factors that affect the quality and accuracy of flood maps; assessed the costs and benefits of map improvement efforts; and recommended ways to improve flood mapping, communication, and management of flood-related data. This research has proved valuable in follow-up activities related to flooding and hurricane impacts. The study concludes that even the most expensive aspect of making more accurate maps—collecting high-accuracy, high-resolution topographic data—yields more benefits than costs and that continued investments should be made in updating and improving flood maps. This study was sponsored by the Federal Emergency Management Agency (FEMA) and NOAA. 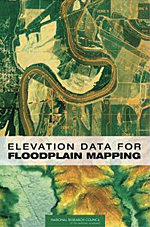 Mapping the Zone followed another flood-related report from 2007, Elevation Data for Floodplain Mapping. That report examined the adequacy of the basemap information available to support FEMA's floodplain map modernization program. The report concluded that existing land surface elevation data is not adequate to determine whether a building should have flood insurance and recommended that high-accuracy lidar data be collected nationwide and incorporated into the National Elevation Dataset that USGS maintains for flood mapping and other applications. This report was a direct response to a congressional request. Many NRC reports have been related to the basics of collecting geospatial data for the nation. 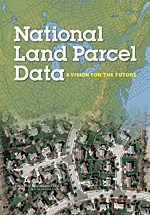 The report National Land Parcel Data: A Vision for the Future, also from 2007, assessed the status of land parcel data (also known as cadastral data) in the United States and concluded that nationally integrated land parcel data is necessary, feasible, and affordable. The report recommended ways to establish a practical framework for sustained intergovernmental coordination and funding that are required to develop a nationally integrated land parcel data system. This highly circulated study was sponsored by the Bureau of Land Management, the Census Bureau, the Department of Homeland Security, the Federal Geographic Data Committee, and Esri. The year 2007 was a bumper year for MSC. Also published that year was A Research Agenda for Geographic Information Science at the United States Geological Survey, which assessed current GIScience capabilities at USGS, recommended strategies for strengthening these capabilities and for collaborating with others to maximize research productivity, and identified research areas. The report called for an initial focus on improving the capabilities of the National Map, which required research on information access and dissemination, data integration, and data models. USGS, which sponsored the study, has placed into action many of the report's recommendations, including a new release of the National Map Viewer. The year 2007 also saw completion of an important report reflecting lessons learned from Hurricane Katrina in 2005. Successful Response Starts with a Map: Improving Geospatial Support for Disaster Management was a report designed to assess the use of geospatial data, tools, and infrastructure in disaster management. It recommended that significant investments be made in training of personnel, coordination among agencies, sharing of data and tools, planning and preparedness, and development of tools. Sponsors were the National Aeronautics and Space Administration, NGA, NOAA, and USGS. These reports cover most of the scope of MSC's research tasks, examining technologies and science challenges surrounding issues of national importance. By holding regular meetings and briefings and by focusing on meeting themes, MSC continues to strive toward providing guidance and leadership on national geospatial issues. 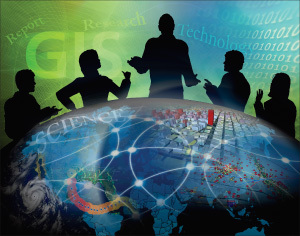 Other groups—professional societies, trade organizations, the National Geospatial Advisory Committee, and state and local organizations—and many other entities follow the GIScience industry and its needs. What distinguishes MSC are its forward-looking focus, a foundation in science, support from rigorous peer review, and the ability to make recommendations likely to influence policy. The list of ongoing issues and studies is continuously evolving. Current studies and meeting information, including membership, are available from the committee Web site at dels.nas.edu/global/besr/MSC. MSC hopes to remain at the heart of the nation's activities surrounding geospatial data and information and to continue to serve the nation as we "investigate, examine, experiment, and report upon" the mapping sciences, a field where the United States often leads the world. Dr. Keith C. Clarke is a research cartographer and professor. He holds an M.A. and a Ph.D. from the University of Michigan, specializing in analytic cartography. He joined the faculty at the University of California, Santa Barbara, in 1996. Clarke's most recent research has been on environmental simulation modeling, modeling urban growth using cellular automata, terrain mapping and analysis, and the history of the CORONA remote-sensing program. He is the author of the textbooks Analytical and Computer Cartography (Prentice Hall, 1995) and Getting Started with Geographic Information Systems, 5th Edition (Prentice Hall, 2010). He is now the chair of the Mapping Sciences Committee of the National Research Council. For more information, contact Professor Keith Clarke, University of California, Santa Barbara (e-mail: kclarke@geog.ucsb.edu).